In the past, a ferry ran past the current Cheongpyeong Training Center from Cheongpyeong Dam all the way to Mogok. A guy from Gangwon province ran the ferry line. 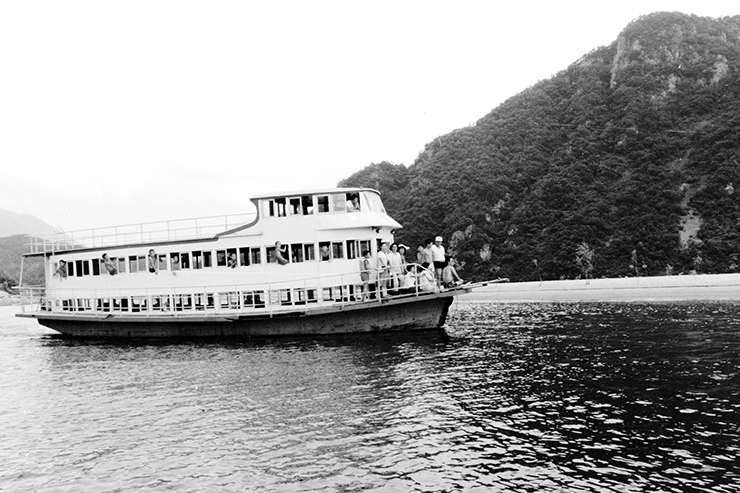 True Parents always used the ferry whenever they travelled to the Original Sanctuary site. Before they moved the fishing site to the front of today’s Original Sanctuary, they used to fish across the river, down the valley, below the Cheonyu Jang (summer house). Then, with a small rowing boat, they paddled upstream to check the waters from Hongcheon River all the way to Nami Island. They had lower a rope into the water to measure its depth. After thorough exploration, they found out that the deepest water was under Seonin Peak. They also climbed every mountain around the area. They poured out their heart and effort to select the right holy ground. The inter-denominational movement officially began at the end of 1970 and early 1971. 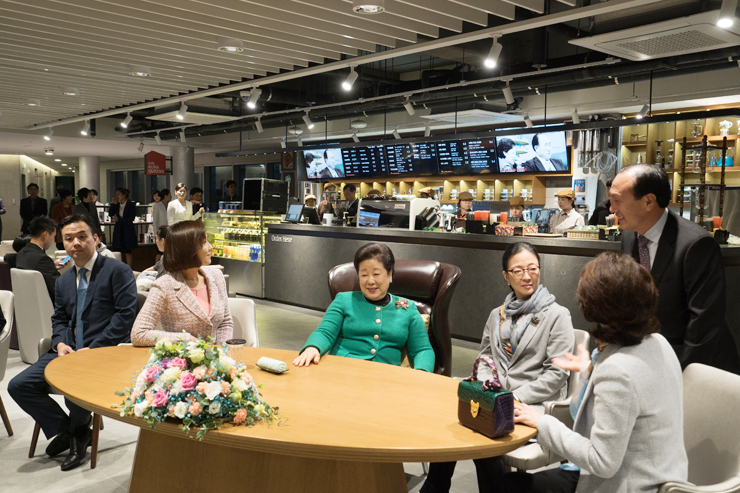 Through this movement, Christian pastors from all over the nation swarmed to Cheongpyeong. The tents for conferences to promote moral living and public hearings became today’s Cheongpyeong Training Center. Originally, the area was a mulberry patch. True Parents used to pitch a small tent when they came fishing. And, when they decided to carry out a public hearing with pastors, they brought large military tents and evened the ground. This work officially began with True Parents digging the first stones on June 17, 1971. 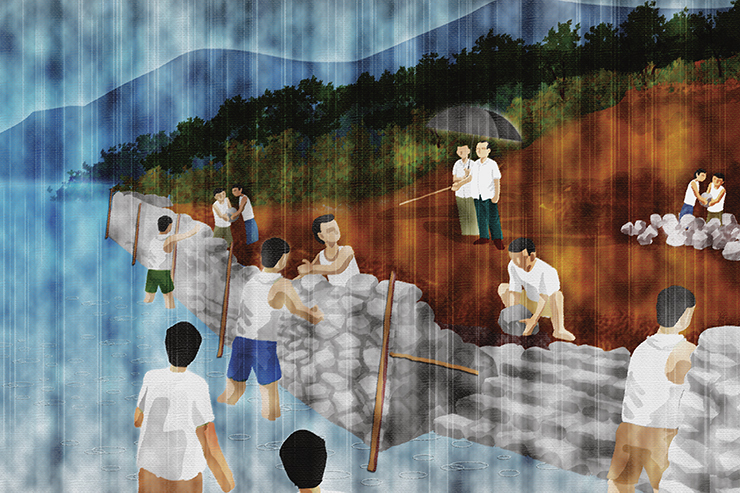 They began the work early to avoid the monsoon season. The leaders of 36 couples also helped with the work, and since they had nowhere else to sleep, they slept in tents at night. When the big tent was ready, True Parents held several conferences to promote moral living as well as public hearings. However, there was a limit to how many people they could educate under a tent. Therefore they decided to build an official training center and began with the construction. In order to complete the building before the monsoon rain, They began shoveling before anyone else. The 36 couples dug the earth and piled the stones. And later, centering on Rev. Do-sun Lim, 30 theology students (yet to be dispatched) joined the workforce as a special unit. At first, they brought professionals to build the ground up high. But with the rain, the workers refused to come. So True Parents, themselves, had to come for work. Under their guidance, the 30 special workforce students carried out the construction. It was True Parents who taught them how to do the work by pointing with their stick and saying “Put the stone here. Put it there,” “Pile it up like this.” They did as they were told. Later, the monsoon brought a lot of rain which flooded the front yard. When the waters were drained, the stones set by professionals all crumbled. But those set by True Parents were firmly put. They were all surprised at True Parents’ work. This tells us that since True Parents knows everything, if we work with their heart in our mind, we can achieve anything. Under countless conditions and continuous guidance of True Parents, the Cheongpyeong Training Center (Original Sanctuary) was completed on July 12, 1971. The Original Sanctuary was the work of True Parents and elder members from the embankment to the completion of the building. If you observe the remaining embankment, the lower part is dark and the upper part is relatively white. The lower part was built by True Parents in 1971 and the relatively white part above was built at the time of the construction of the Cheonseong Wanglim Palace in 1999. True Parents, who started fishing in Cheonshim Lake in the late 1960’s, initially borrowed a wooden boat for their fishing condition. Since it was inconvenient to borrow every time, they purchased a wooden boat from a nearby wooden boat merchant. This boat was used until a motor boat was purchased. This wooden boat has been discarded because of deterioration. 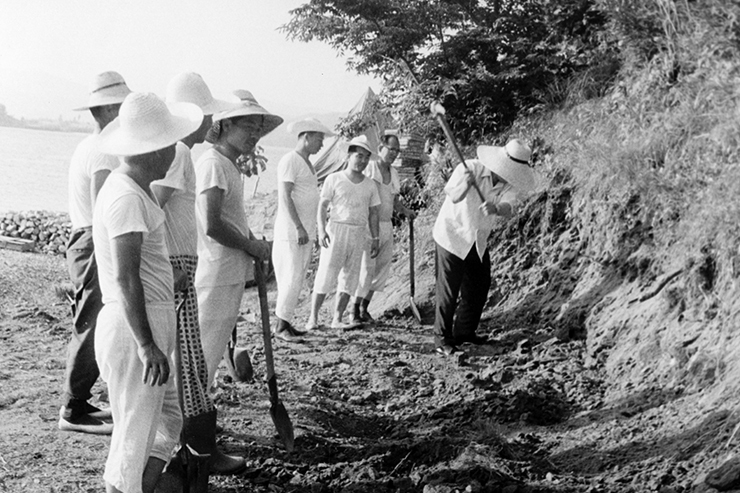 Cheonseung-ho left Incheon and arrived at Cheongpyeong Training Center on Sept. 21, 1971. The 3rd fl. of the ship was further built under the direction of True Parents at the shore of Cheonshim Lake (near the present CheongShim Peace World Center). Cheonseung-ho was used by many members who visited the Cheongpyeong Training Center and it was docked at the rear site of the current HyoJeong Café. 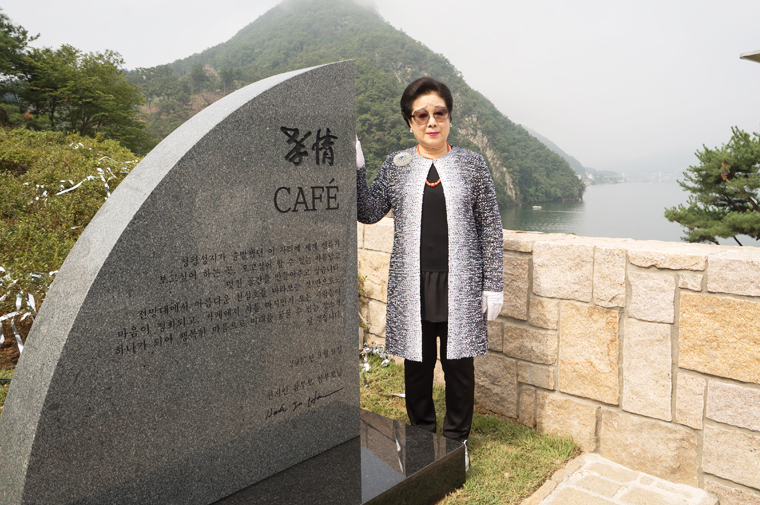 On Sept. 9, 2017, the HyoJeong Café dedication ceremony was held with 300 members with True Parents. At 10:25 am, True Parents arrived in front of the bridge connecting the HyoJeong Cafe and the Cheonseong Wanglim Palace to officiate the first part of the ceremony. The Dedication Ceremony was carried out by Vice President Myong-kwan Lee (Master of Ceremony) and The event then proceeded as follows: Opening Remarks, Bow of Greeting, Floral Tribute, and Unveiling Ceremony of True Parents’ Cornerstone. They walked over the bridge and entered the 3rd floor of HyoJeong Café where they gave the sanctification. After this, they visited the HyoJeong Food Court on the 2nd floor, Jaemiin shop on the 1st floor and the Marina. They also sanctified the Marina, blessing the newly bought boat ‘HyoJeong No.1’. “You did a great job today. 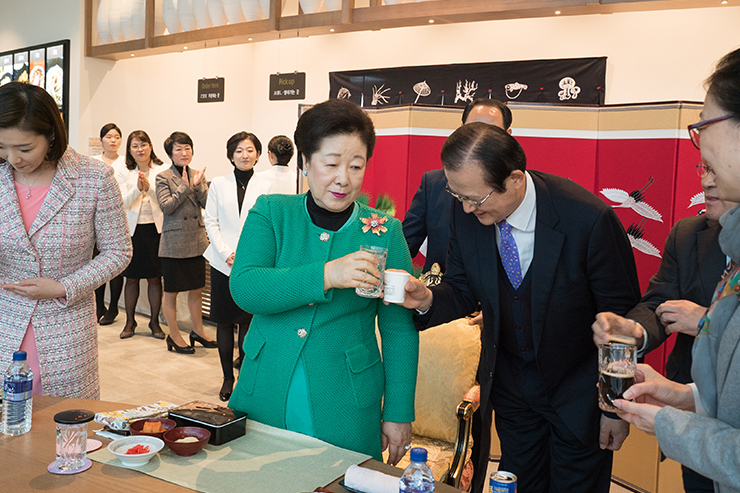 In the same year, on 9.16 by the heavenly calendar (November 4) at 5:09pm, the Tasting Event to celebrate the opening of the HyoJeong Café was held with True Parents. True Parents first tasted tonkatsu, tonkotsu ramen and then fish cake udon. Then, at 5:50pm, True Parents moved to the Café Kona Queens on the 3rd floor where They drank a cup of tea and ate Las Vegas cheesecake. True Parents asked the leaders who attended to sing songs; it was a joyful moment for all attendees to join together as being in Heaven on Earth.